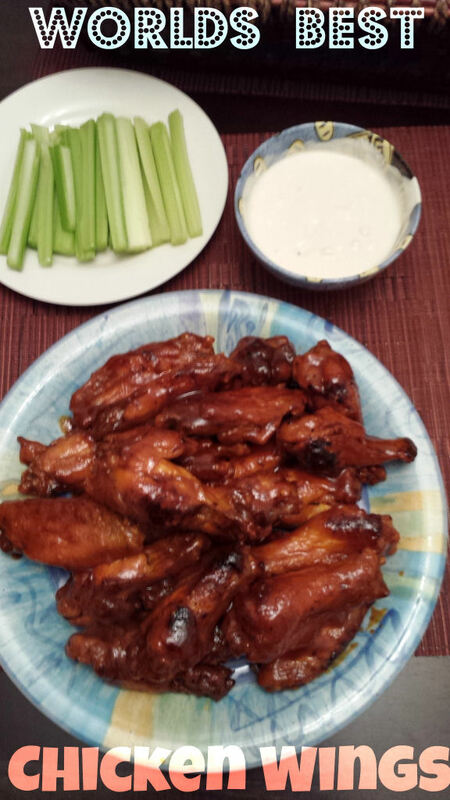 Disclosure: The chicken wings recipe is shared by my husband Dave as well as his thoughts. True story. It is almost time for the big game this weekend with the Seahawks meeting the Broncos in frigid MetLife Stadium in New Jersey. Well the big concern that the weather would be a factor for the game may be unwarranted since predictions are for a pretty mild day this Sunday. Temperatures should be in the high 30’s or early 40’s with a chance of rain. So those of you that were hoping for another ice bowl may be disappointed come game time. Come Sunday whether you are hosting a Super Party or going to one it is important that we talk about one food that is a must. I’m talking about hot chicken wings. To me hot wings and Super Bowl parties go hand in hand like birthdays and ice cream cake. When I think about the big game parties I immediately have images of fun times, good friends, and great food. As you pretty much have guess by my intro I’m going to be focusing on hot chicken wings for this blog article. Now my love affair with hot wings began when I turned 21, which was some time ago. My good friends Mom suggested that we check out some local pubs on Friday’s after work for their happy hours. I had never heard of happy hour before then but it sounded pretty good. Also before this I had never eaten a hot chicken wing. I remember this first Friday afternoon after a hard week at work we cashed our paychecks headed home to shower and change and then went to a local pub for happy hour. When we arrived the waitress told us that drinks were 2 for 1 and that they had a 20-cent hot wings special. My friend sitting across from me ordered 40 wings for us to share along with our drink order. I looked at him like he was crazy. I was like what are you kidding me 40 wings that’s allot. Little did I know that these wings were the most delicious things that I ever tasted. Anyway when the wings arrived they came with celery sticks and blue cheese. I asked him what they were for and he said the blue cheese was for dipping and the celery was for cooling off your mouth. After cautiously eating my third wing I was hooked. Even though my mouth was on fire I couldn’t get enough of these tasty chicken wings treats. This was my first experience with hot wings and it sure wouldn’t be my last. Over the next couple of months of that summer and going into the fall we went to this pub every Friday afternoon for happy hour. Occasionally some of our other friends would join us and the wing order would go up to 60 to 80 wings. We eventually became so well known at the pub that I think they planned their budget around us. All kidding aside this was the beginning of my hot chicken wing journey. Moving forward to about 13 years ago and many hot chicken wings later I decided that it was time to come up with my own hot chicken wing recipe. 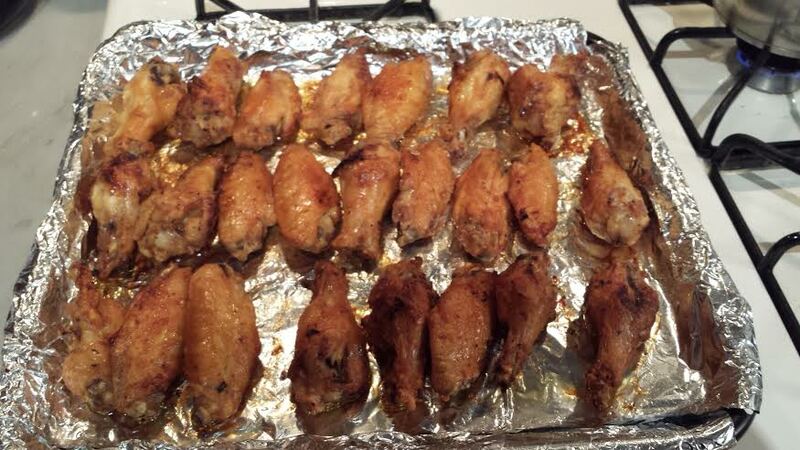 My wife had also become a big fan of chicken wings and we figured it would be better to cook them up at home. That way we could enjoy them in our apartment with friends while listening to our own music and playing darts in our kitchen. Yes we used to hang a dartboard in our kitchen and spent many a Friday night playing with our friends. Getting back to the wings I did some research online about cooking wings and hot sauce recipes. Most of the recipes online called for deep-frying the wings. Since we didn’t have a deep fryer I figured I would improvise. At first I would fry the wings in a pan with a little bit of oil. I would then take the wings and toss them in a bowl with some basic over the counter wing sauce. Lets just say that the results were just ok. They tasted like cheap wings you would get at a Chinese take out restaurant. 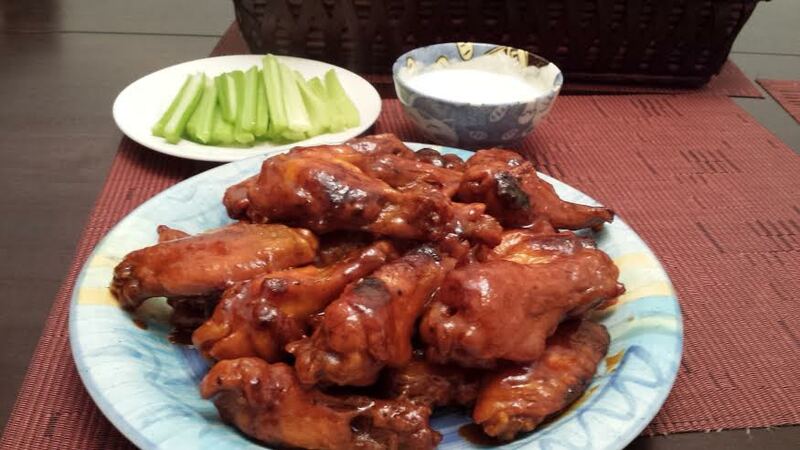 As time progressed I began experimenting both with the sauce recipes and the method of cooking the wings. Now for the purposes of secrecy I cannot reveal the final ingredients of my hot sauce. Which my wife has lovingly referred to as “Dave’s Hot Wing Sauce”. However I will give you some great ideas and teach you about an awesome way to cook your chicken wings that is healthier than deep-frying. Ok first your going to need to get some chicken wings. I prefer Perdue’s wingettes, which can be found in most major supermarkets. They are a little bit more expensive that regular chicken wings but they are already cut and ready to put in the pan. They are also large and full of meat, which is very important. Once you have your wings heat up a large cooking pan to medium heat. Do not use any cooking oil at all. Next place your wings in the pan and lightly season them with garlic powder and cumin. Cumin is an Indian spice, which adds a great flavor to the wings. Cook the wings on each side until they are nice and browned. This should take about 5 minutes on each side but make sure you keep an eye on them. After they are browned nicely place them on a foiled baking pan. You should line them up in organized lines that way they can easily be flipped later on. Turn your oven on to a low Broil and place the baking pan on the middle rack of your oven. Set the timer for 19 minutes. Depending on your oven I would check the wings to see if they are burning. The tops of the wings should continue to cook and brown but shouldn’t dry out. If you see they are cooking too fast then lower the oven rack. After 19 minutes or so you should flip them and set the timer for 15 minutes. After this the cooking time is up to you. I suggest you do it by site and feel. Some people like their wings well done and a bit crunchy and some like them soft. I like them somewhere in the middle. Like the feel then your chicken wings are simply coming off the bone. Keep cooking and flipping the wings setting the timer at 5-7 minute intervals. Remember your eyes will be your best judges of how well they are cooked. While the wings are cooking you need to work on your hot sauce. I will give you a few pointers but I’m not going to give away the whole recipe. Sorry but it is my secret sauce, which I have been perfecting for years. First your going to need a small or medium sized saucepan. You begin by melting butter or margarine over low heat. Once the butter is melted you add some flour to it, lets say about a tablespoon. I prefer whole wheat to white flour. The flour helps the sauce thicken later on. I prefer to add it at this stage so I can work out all the lumps. After flour you then add a tablespoon or two of light brown sugar. Cook it over the light heat until it caramelizes and is nicely blended into the sauce. When the sauce is a nice smooth consistency you are ready to add a cup or two of Franks hot sauce. The Franks sauce is the base of this sauce but only a little part of this recipe. Now after this I have to be very secretive about what goes next into my sauce. 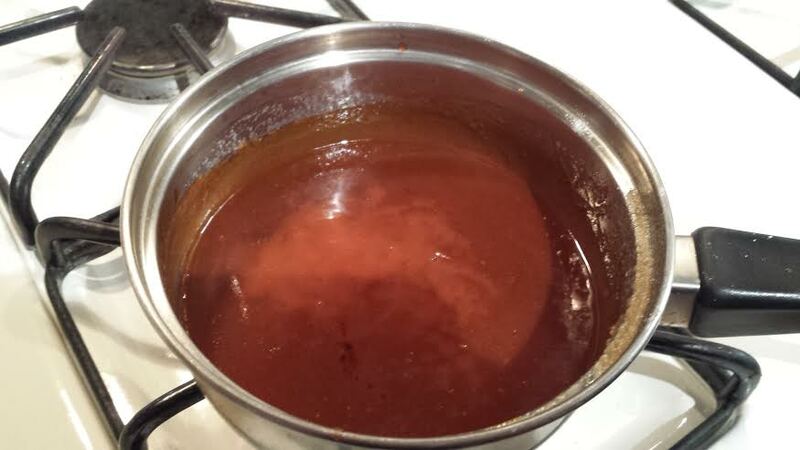 Lets just say that Tabasco sauce, barbecue sauce, maple syrup, and a few other ingredients go into my sauce. 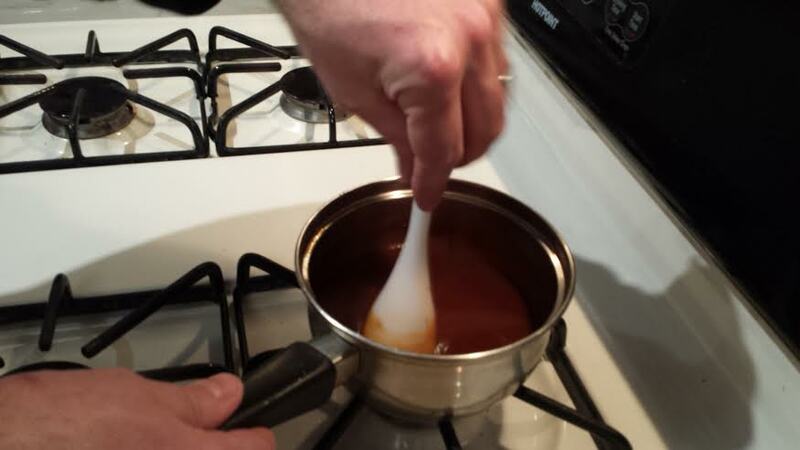 I will tell you if you want a nice thick stick sauce you will allow the sauce to simmer longer. If you like your sauce thick and drippy then keep the heat low and keep stirring it. After the sauce and wings are ready the next step is key to enjoying your delicious wings. I suggest that you fork your wings before dipping them in the wing sauce. Forking means your stab the wings a couple of times each with a fork. This enables the wing sauce to penetrate deep into the wings. I then hand dip the wings in the saucepan. I do not pour the sauce over the wings or mix them in a bowl. It takes a little bit longer this way but to me it preserves the wings shape and insures that each wing is fully sauced. After they are placed on a plate they are ready to enjoy. Of course you must have blue cheese, celery sticks and allot of napkins. For the blue cheese you can take any brand of your favorite dressing, add some sour cream and a little bit of Worcestershire sauce to it and mix. Then sit down at your kitchen table with a bunch of friends, a few ciders, wine or beer and you are ready to go. How are you getting ready for The Big Game this weekend? Are you planning on heading to party or are you maybe hosting a party of your own? Comment below and let me know what type of snacks you like to serve at get togethers I’m obviously a fan of chicken wings, tortilla chips and white cheddar popcorn so I’m always curious to see what other people like!